A few of you were interested in other recipes to make with the white beans I added to the escarole soup. Here’s my take on this hearty family favorite….enjoy! Heat olive oil on medium high heat. Add pork, garlic and red pepper flakes, sauté for 3-4 minutes until pork is cooked or heated through. Add potato, stock, tomatoes and thyme. Partially cover and simmer for 20 minutes until potato is cooked. Add pasta and beans, simmer for 5 minutes. 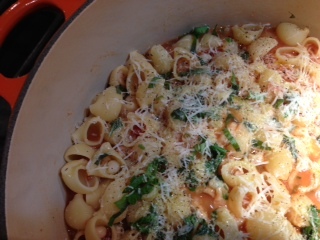 Drizzle with good olive oil (optional) and add basil. Top each serving with cheese. Serve with a fresh green salad.